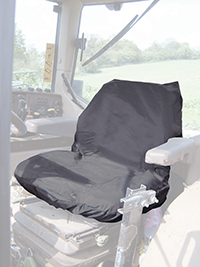 Standard tractor seat cover suitable for agricultural vehicles. This seat cover protects smaller tractor seats from damage and dirt. Robust and hardwearing, this seat cover has been designed for use in the harshest of environments and will help preserve the value of your investment. Perfect for protection industrial and agricultural environments. Available in Grey, Black, Blue and Green. Elasticated base for easy fitment.